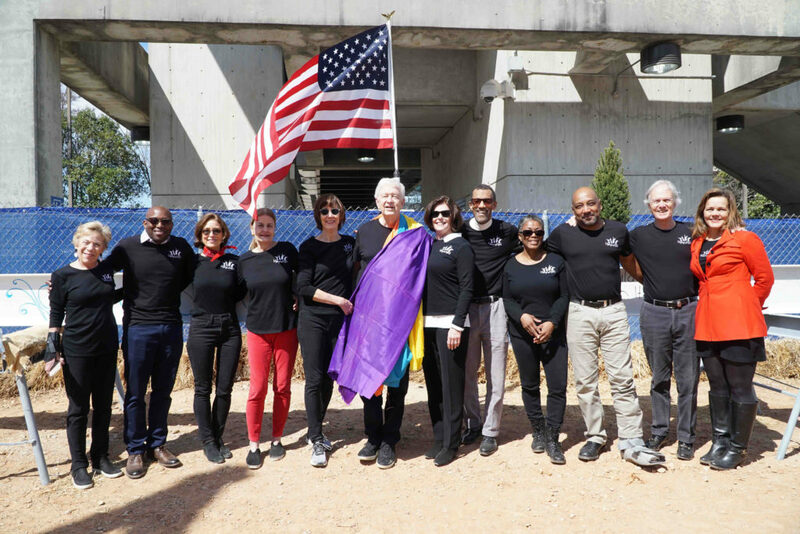 On Tuesday, March 19, 2019, Moving in the Spirit gathered with project partners from MARTA, Columbia Ventures, and Perkins+Will to celebrate as the final steel beam was placed on the framework of our new facility, A Space to Soar, at Edgewood/Candler Park Station. 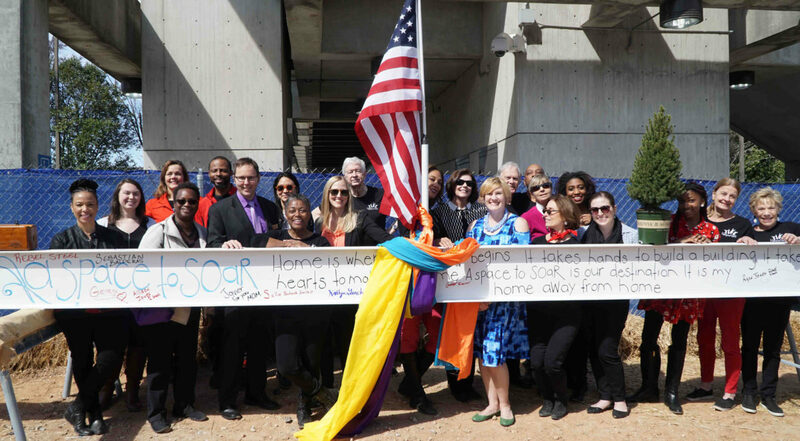 Marking a major construction milestone, the topping off ceremony featured remarks from Moving in the Spirit’s board president, Jaimie Hardin, as well as two of our three co-founders, CEO Dana Lupton and COO Genene Stewart. Guests from all facets of Moving in the Spirit’s journey — including families, alumni, partners and donors — gathered to sign the beam before it was lifted into place. 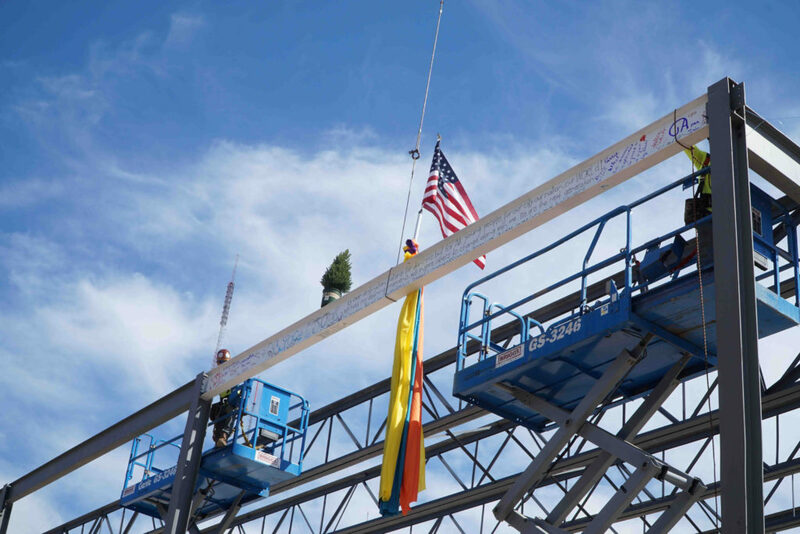 The beam was decorated with a poem written by Moving in the Spirit student Janan Mirza, age 17, representing the voices of all the young people who will soar in the new facility. Once the facility is completed, Moving in the Spirit plans to scale the number of students we serve to 500 and reach thousands more through performances and workshops held in our new 150-seat theater. A Space to Soar’s location directly on a MARTA rail line will help to ensure accessibility to our creative youth development offerings. We are ever grateful to MARTA and Columbia Ventures for selecting Moving in the Spirit as the community arts anchor for their transit-oriented development at Edgewood/Candler Park Station. We especially want to thank our building and design partners, many of whom donated services pro bono: Structor Group, Perkins+Will, WSP, and KSi. Moving in the Spirit anticipates opening A Space to Soar in March 2020. We completed the initial threshold of our capital campaign last fall, raising $8.4 million for the project, and has launched a paver and seat-naming program to raise additional funds to outfit its new state-of-the-art theatre and build community partnerships. You can learn more about A Space to Soar — and keep up with the live building cam — here.